In the shadows moving behind whispering leaves, in a place seen through a glass darkly. Jared was there. She had been able to reach him across an ocean: she had to believe she could find him now. “You don’t understand,” Ash said hopelessly. “I understand this,” Kami returned. “Think of where he is, conjure it up, bring it closer. Open a door for me, or I swear to God I will break through a wall.” She stood up and reached a hand across the pool to Ash, whose fingers closed around hers, unexpectedly strong. “I’m going in after him,” Kami said. “Don’t let go of my hand.” She took a firmer hold on his hand, and jumped into the pool. It was like taking a tumble into the night sky. She felt like she was falling through fathoms of airless darkness lost beyond recall. Ash’s hand stayed tight clasped with hers, though it made every muscle in her arm scream to hang on. She struck out with her free hand, blackness all around her, skin burning with cold and lungs burning from lack of oxygen. This was a nightmare eager to swallow her whole, but if Jared was here, some part of her could survive here. She was not going to give up until this place surrendered what was hers. She reached out again and again, fingers finding nothing, and then she clawed through nothing. She kept searching: she’d pulled him out of this pool once, he’d saved her from drowning once. Jagged pieces of memory slid through her mind, and she felt that if only she could put them together, she would understand how to get to him. Except that she did not know how. All she knew was that she was not giving up. Darkness was blotting her out, but she made the thought of finding him her last light and chased it until even that was winked out and was lost. Kami could feel her fingers again when she felt another hand brush hers, and knew whose it was. She held on with all the strength she hadn’t known she had left, entwined her fingers with his, clinging so hard that they would be drowned or saved together. She hung onto him and hung there in space, numb and almost content. Then she was drawn up through the water, inch by painful inch. When she surfaced, her lips opened and she breathed in mingled air and water. She choked and held on to both boys’ hands so fiercely her fingers felt as if they might break. 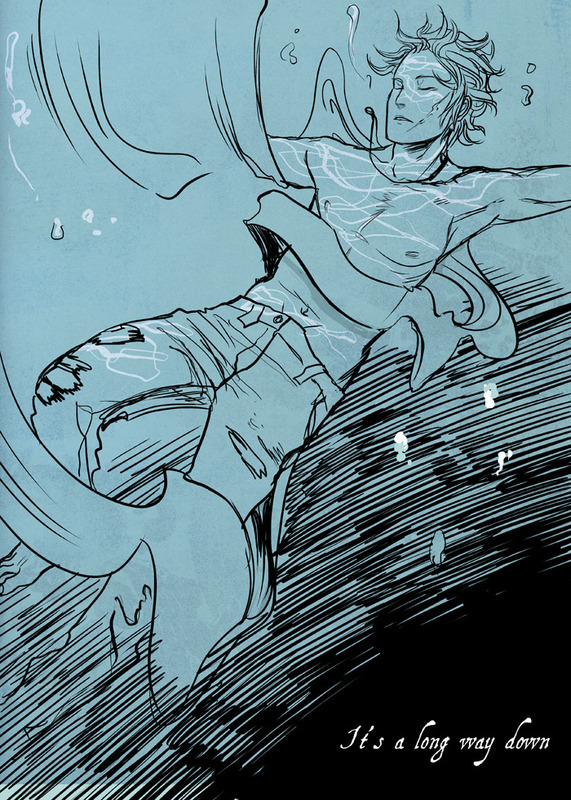 Ash was saying something, murmuring words of horror and relief, as he helped Kami out of the water. She knelt in the cold dirt and felt Ash’s hands through the soaked material of her shirt. “Help me,” she rasped, pulling their white linked fingers apart and plunging her now-free hand back into the water. Ash reached into the water again too, grabbing fistfuls of Jared’s shirt. Together they dragged him out of the pool and laid him on the moonlit-white broken grass. Jared lay still as the dead. He should have been dead, Kami realized. The tiny gold lines of his eyelashes were kissed by frost. His hair in her lap was glittering with ice crystals. But he was still holding on to her hand, grasp sure and strong. “Jared,” Kami said, desperate and commanding. Jared opened his eyes suddenly. They were paler than she had ever seen, white and treacherous as the winter ice she had shattered to get to him. Jared’s lips moved, shaping her name. Drops of water landed on the silvery lines of his face. Kami could not tell if it was lake water dripping from her hair or tears. She bent over him as he shook in her arms and started to breathe like a human being again, in shuddering gasps as if he might live. Lightning flashed overhead like an answer to her, that he would keep being this bitter sorcerous stranger, that perhaps he had never been anything else. It bleached the whole world white, the pools turning into diamonds. The drops of water on the planes of Jared’s face, on the pale line of his bared throat, gleamed like broken glass. Kami covered her eyes with her trembling hand and thought: I can’t keep acting like this. I cannot continue to be this stupid. I’m crying my eyes out… I love them, I love them with all my heart! “I cannot continue to be this stupid.” Is how I feel every time I reread Unspoken. I can’t wait for more Kami and Angela. Aw, you are very intelligent and lovely. 😉 I hope you will eeenjoy more Kami and Angela! My god, This is torture. I picked UnSpoken up the first time about 3 weeks ago so I have less time to wait but it’s still TORTURE!!! Thanks for the Snippet!! Ugh. Always right in the feels. I was holding my breath for a few seconds!